It’s been a good week for new releases at the end of August, with ‘American Made’ coming out in the same week as ‘Logan Lucky’ and ‘Detroit’. 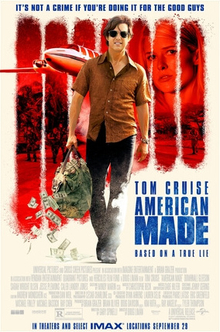 It perhaps suffers a little in comparison against these superior movies, but ‘American Made’ is great fun, and a solid retelling of the fascinating real life story of Barry Seal. When we first meet Seal, he’s a TWA pilot with a loving family at home, who he partly supports through a spot of mild smuggling. When this is exposed, instead of being sent to prison, the CIA utilise Seal’s skills as both a pilot and a smuggler to undertake a variety of tasks at the behest of the agency. On top of this, Seal ends up getting involved with Pablo Escobar’s Medellin Cartel, and his undercover expeditions become even more dangerous as he starts to smuggle drugs across the border. It’s fair to say Mr. Seal led a more interesting life than most, and it’s perfect fodder for a movie. The film is based on video diaries Seal filmed of himself later in his life, so it’s reasonable to expect there’s a degree of embellishment in his stories, but it’s hard to argue it makes for great entertainment. Tom Cruise often has a habit of overshadowing the characters he plays, but he’s really good here as a character perfectly suited to his larger than life persona, and he has the perfect level of energy to embody a man who just seemed to bounce from one ridiculous adventure to another. It’s a film very much in the same ‘how was this allowed to happen’ vein as last year’s ‘War Dogs’, and both also share a similarity in exposing the murkier side of US foreign policy (albeit most of this has came to light anyway – last year’s excellent ‘Kill The Messenger’ provides a less cavalier and more sobering account of the Nicaraguan situation). The direction and pacing is light and breezy, which makes for a perfect match with the comedic slant the filmmakers are going for. ‘American Made’ is an over the top, energetic movie that mostly does justice to the ridiculous true events it is based on, and it’s a really solid and enjoyable piece of entertainment.